I need help converting this project to reality for my office that I currently work in. 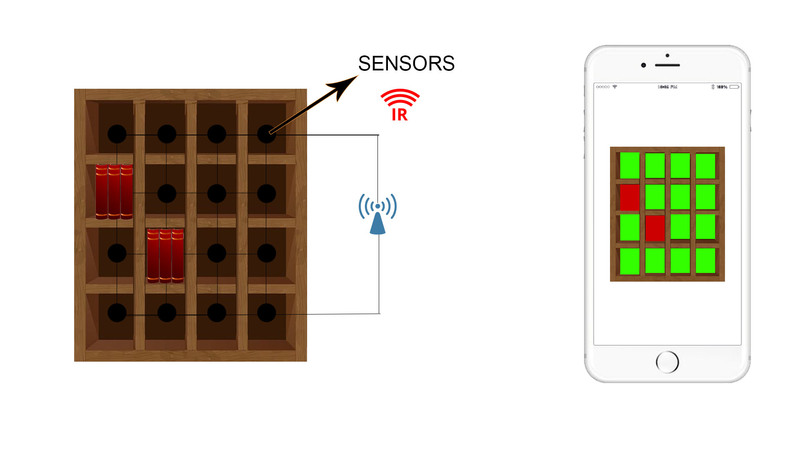 I basically want to have sensors(idk which or what kind) behind a bookshelf in individual racks and have those sensors communicate with an app to tell if that rack is full or not. I have no background in programming or robotics but I am willing to learn and read as much as possible if someone can guide me in the right direction it would be really helpful. I also wan it to be as cheap as possible. I would suggest to start with something simple and later on work out the small details. For a fast Proof of Concept you can use an Arduino Yun which comes with built-in WiFi connectivity. The Arduino will be connected to an array of proximity sensors, either ultrasonic or IR, and will return the racks with books, simply check if the distance retrieved by the sensor is less than x cm, where x is the length of the single rack. Obviously you should take an average of several measurements with a small delay (say 10 uS) because these sensors are subject to heavy fluctuations and may cause false positives/negatives. Then the Arduino will connect to a backend and stream all the data using one of the several available protocols. You can use an online ready to use backend such as Temboo to visualise data and later on develop a smartphone app. Further improvements can be on the uC and code side, maybe using a raw ESP8266 to be put in sleep mode and enabled once a while to poll sensors and trasmit data to go back in low power mode. Not the answer you're looking for? Browse other questions tagged arduino sensors or ask your own question. How can I detect ground collision, for an hexapod robot? How to detect writing on a chalkboard?